Figure 1: The compact M3-FS or M3-F focus module is a complete lens motion system – no external control board is needed. Use it to move high-quality glass or polymer lenses with high precision, for superior image quality compared to non-traditional lenses. The closed-loop system has high repeatability and low dependence on temperature. New Scale M3-F S and M3-F focus modules mount directly to a printed circuit board over a CCD or CMOS image sensor. These tiny modules add precision focus to OEM cameras while preserving their compact size advantage. They accept high-level motion commands directly from your ISP – no additional control board is needed. The module accepts standard threaded lens assemblies and is only slightly larger than the lens assembly. It provides millimeters of lens motion with 0.5 μm resolution. The M3-FS has the added benefits of high dynamic stability, minimizing pixel shift when the camera is moving and changing orientation. Board cameras are used in miniature handheld, mobile and portable instruments for medical, industrial, scientific and security applications. 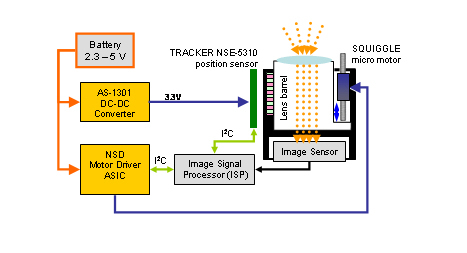 An image sensor is mounted on a small printed circuit board, typically with a fixed lens mounted over the sensor. better image quality over a wider depth of field, increasing system accuracy. faster and more accurate sample analysis in medical diagnostic systems and miniature microscopes. macro as well as wide field imaging with one camera, allowing greater variation in distance between the camera and the object imaged. 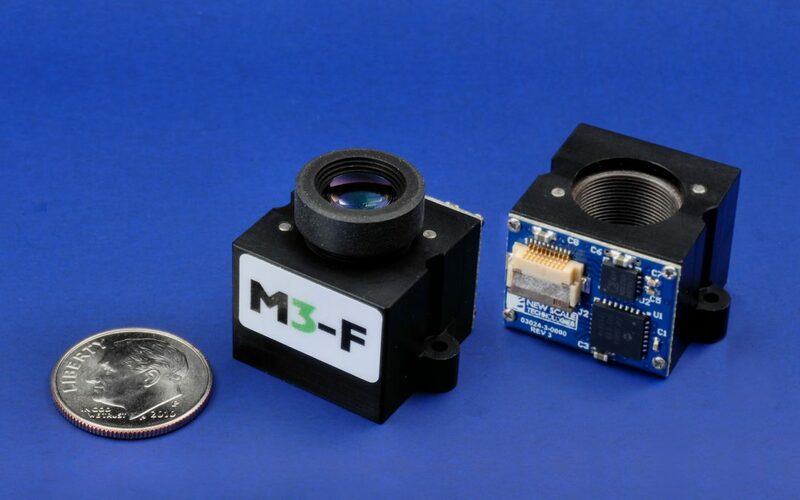 Figure 2: The M3-F or M3-FS focus module mounts easily over the image sensor on compact board cameras, and accepts high-level motion commands from the system processor. It can be easily and rapidly customized to fit a wide range of board camera and standard lens assemblies. Alternative focusing systems such as liquid lenses or liquid crystal lenses rely on the ability to control changes in composite materials: e.g., the curvature of a liquid-oil interface in a container, or the refractive properties of a liquid crystal composite. These composite systems are highly dependent on material consistency and environmental factors such as temperature. In addition, their transmission and clarity is far inferior to that of traditional glass or polymer lenses. The M3-F focus module allows you to move traditional, high-quality lenses with high resolution, repeatability and accuracy. As a closed-loop system, it can be easily calibrated and controlled for high accuracy and repeatability independent of temperature. It does not exhibit the hysteresis characteristic of liquid crystal lenses. The M3-F is a cost-effective system solution with embedded closed-loop drive circuit for high repeatability with low external processing requirements. It operates on 3.3 V with low power requirements and holds focus with the power off. New Scale’s M3 focus modules can be quickly adapted to fit a wide range of image sensor, board and lens combinations. The M3 platform offers flexibility to accommodate specific board mounting, lens travel (macro to infinity), lens thread and motion control needs. This enables OEMs to create high-performance board camera solutions in less time and at lower cost. 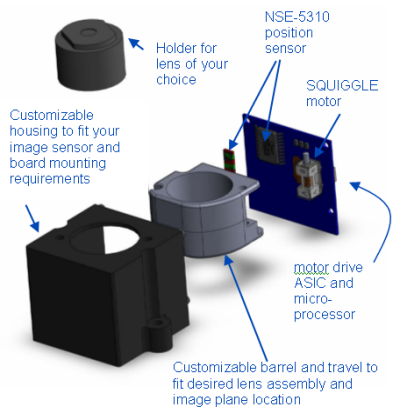 Each module incorporates a piezoelectric SQUIGGLE micro motor, magnetic position sensor, motor drive ASIC and microprocessor with a moving lens holder in a robust polymer housing (Figure 3). The customer defines the PCB mechanical mounting interface, dimensions of the threaded lens assembly, and the macro and infinity image plane locations. Housing dimensions are approximately 20 x 23 x 16 mm depending on OEM specifications. Figure 3: M3-F customizable autofocus module design platform. The M3-FS focus module has an aluminum structure and ball bearing guide mechanism to minimize lens tilt and maximize dynamic stability. This makes it ideal for miniature handheld, portable and mobile systems. The M3-F focus module has a molded polymer construction and a pin-bushing guide. It is an economical choice for lower precision requirements or fixed camera positions. 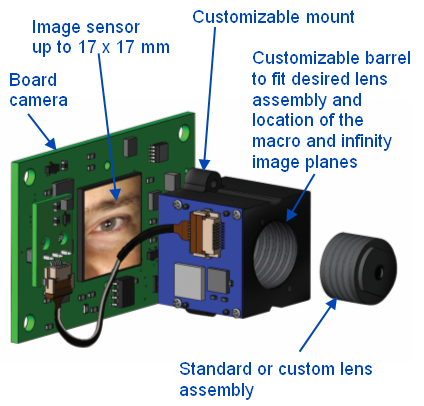 A block diagram for a motorized focus module in a board camera system is shown in Figure 4. The focus module mounts on the OEM’s camera PCB, over the image sensor. The SQUIGGLE motor moves the lens barrel. The NSE-5310 position sensor detects the movement of a multi-pole magnetic strip attached to the lens barrel, and provides the direct digital position information to the microprocessor. The NSD motor controller ASIC accepts commands from the processor via I2C or SPI interface, and drives the motor. The system operates on standard 3.3 V battery power. Additional detail about the components follows. A patented SQUIGGLE micro motor provides high-precision linear motion, with no gears and no need for lubrication. It holds its position without drawing any power. Its high speed enables rapid focus, further reducing power use and improving the user experience. This robust piezoelectric device offers quiet, ultrasonic operation. It is smaller, more power-efficient and more precise than stepper motors. The NSE-5310 is a magnetic sensor array with integrated on-chip digital encoding. The sensor measures the spatially-varying magnetic field produced by a moving magnetic strip mounted on the lens holder. It provides direct digital output of the absolute linear position within a 2 mm range. It does not require a light source or a separate zero-reference sensor. There is no need to hunt for zero position on power-up, resulting in lower power use and less wait time to capture images. Standard I2C protocol enables simple integration into the system processor. An NSD piezo motor driver ASIC is powered by a single 3.3 V battery. Like the sensor, the motor driver ASIC uses a standard I2C interface for integration with the system processor. It creates pairs of phase-shifted square waves to drive the motor. On-chip registers store driver instructions. A power-down mode provides for minimal power consumption in stand-by. The drive electronics are integrated into the module. Figure 4: Simplified block diagram of the customizable focus module design platform. A variety of algorithms are used for autofocus. One involves moving the lens through its entire range and identifying the lens location which delivers the best image quality. The system may capture images at multiple points in the process and keep the best image; in this case the motion step and settle time are primary concerns. Alternatively, the system may identify the optimum position for focus and then move the lens back to that position for final image capture. In this case, the primary motion concerns are resolution, repeatability and accuracy. These are discussed below. Position resolution determines the minimum resolvable distance the lens can move. In the M3-FS and M3-F this is 0.5 μm, providing excellent fine control over the lens motion. Repeatability is a measure of the system’s ability to return the lens to a previously defined position. In many algorithms, better repeatability means better focusing. The direction in which the target position is approached impacts repeatability (Fig. 5). Unidirectional positioning, in which the target position is approached from the same direction every time, provides better repeatability. Figure 5: uni-directional vs. bi-directional positioning. Figure 6 shows data from an M3-F error and repeatability measurement. For this measurement the M3-F’s integrated motion system is used to drive the lens to a series of target points, forward and reverse, over its full travel range. The process was performed twice. 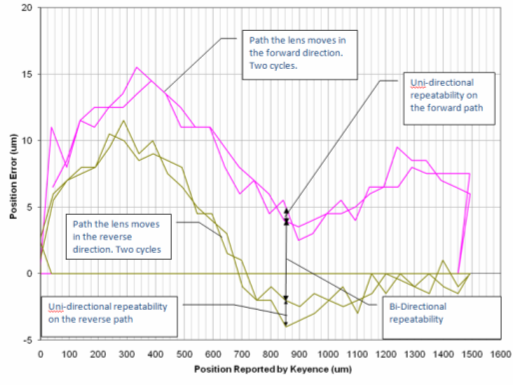 The X axis shows the recorded lens position after each commanded move, as measured by a reference position sensor (Keyence). The Y axis shows position error for each target point, that is, the difference in lens location measured by the reference sensor vs. that measured by the M3-F’s integrated position sensor. The pink curve shows lens position error while traveling in the forward direction. The gold curve shows the error for each of the same positions while traveling in the reverse direction. Repeatability is the deviation of actual position measured by the reference sensor at each of the target positions. The graph illustrates repeatability by the vertical difference between the curves. The difference of the curves while traveling in the same direction is less than the difference while traveling opposite directions. We can simply reverse direction and stop at the 850μm position. The actual variance from the optimal position could be up to 6-7μm (bidirectional repeatability). We can move in the reverse direction, travel past the 850μm position, and then move in the forward direction to stop at the 850 μm position. The variance from the target position would be reduced to a maximum of approximately 1μm (uni-directional repeatability). Scenario 2, with better repeatability, will result in images with better contrast than scenario 1. The product designer would need to evaluate this higher contrast vs. the impact of the additional lens motion on focusing speed. The standard focus module in an M3-FS or M3-F developer’s kit can accept a broad range of lenses and accommodate image sensors up to 17 x 17 mm including 1/2″ and 1/1.8″ formats. Please refer to the design note, Checking Optical and Imager Geometry, for lens recommendations and guidelines for determining your image sensor and lens compatibility. These standard modules can be used in volume in OEM systems, or New Scale can quickly customize M3 modules to accommodate OEM requirements not met by the standard design. See the on-line custom specification worksheet. M3-F modules require input voltage of 3.1 to 3.6 V. They are configured for standard SPI or I2C serial interface. Details on communication formats and the command set are found in the M3-F Command and Control Reference Guide (registration required). Typical performance specifications for M3-F and M3-FS developer’s kits are found here. New Scale offers custom motion systems to meet OEM specifications. The M3 micro-mechatronics design platform allows us to quickly create custom autofocus modules to meet unique OEM optical and system needs. Use our specification worksheet to request a proposal for a custom M3-F module. Developer’s kits are available to qualified OEMs as part of a development program with New Scale, or for purchase from reps and distributors.